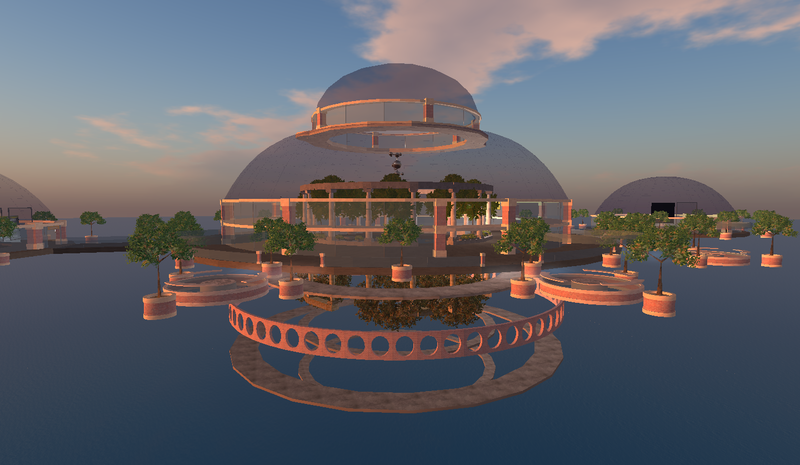 Idahonia is a large, vibrant, virtual campus comprised of three or four connected islands, with another one under development. I learned about it last week at the Virtual State Fair and University Expo (see my previous blog). To feel that I could even begin to do justice to Idahonia in a blog took me three visits on three separate days. My first visit began in front of the Administration Building, which is on the first island developed (funded by two grants received in 2007; other grants for other islands and installations followed in 2010 and 2011). 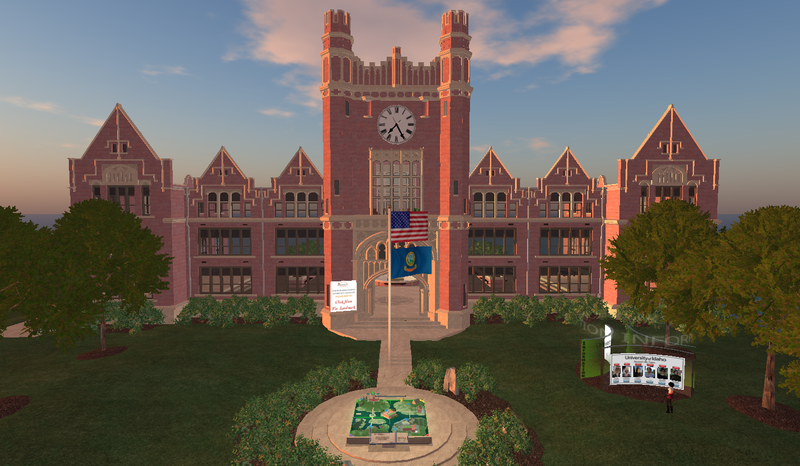 This Collegiate Gothic building is a virtual representation of the actual building. It’s a beautiful building, for sure, but, frankly, I wasn’t all that impressed, probably because I’ve been on a lot of college campuses, in real and virtual life, and figured I had arrived at another virtual campus that strives to represent the real. Representation is, generally speaking, an admirable virtual goal, one that may help students unfamiliar with virtual 3-D environments feel more at home. But it seems to me that if you’re going virtual, why not create something new and imaginative, something that gives learning an interesting twist not possible in the real world? It took me a while to see that the creators of Idahonia have beautifully done both: represented and stretched into the fantastic and futuristic. In fact, it wasn’t until my third visit that I found a notecard with landmarks for reaching the splendid Skydome. If I had arrived there first, as perhaps new students do, I may have been disoriented in an awestruck way yet ready to embrace a new way to learn. Hmm. Both types of landing sites, conventional and imaginative, have their strengths. The Skydome floats high above the campus and actually has three domes: the large one looks to be an orientation area, with a large 3-D grid of the campus in the center (3-D representation within a 3-D virtual environment – such things continue to amaze me); the smaller domes on each side are lecture or presentation areas, mini-amphitheaters. Even on my first visit (sort of a scouting trip), I found a number of charming spots, for example, the haunted Halloween installation for a recent 4H convention (only a few pumpkins and a ghost remained when I made my last visit) and the gathering spot below, which overlooks the sea. The building in the background is part of the School of Family and Consumer Sciences (College of Agricultural and Life Sciences). One of the newest installations appears to be the Isle of Fiscal Capability, which, as the sign in the photo below says, is “an immersive educational simulation in which you will learn about personal fiscal health.” It looks to be both informative and fun. But, as a book lover, I’d have to say that my favorite spot was the Presnell Gage Library. Whether or not it’s a representation of an actual library, I can’t say. In any case, it’s certainly unique: a complete building floating way up in the sky – an untethered building in space, sort of like Dorothy’s farmhouse in the tornado but without the wind. I found it while exploring the Virtual Albertson Building (College of Business and Economics). I walked into a dim wood-paneled room, which was quite a switch from the bright classrooms that looked like classrooms, and accepted an invitation to teleport to the library. 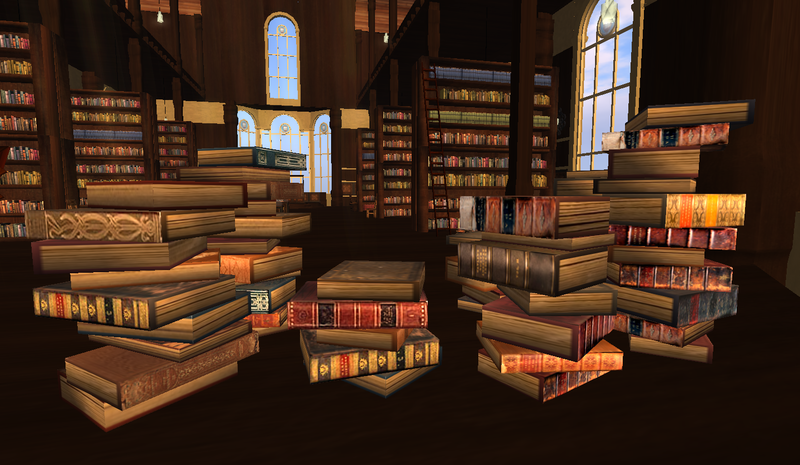 Zoom, there I was, surrounded by shelves of books with sunlight filtering through arched windows. I spent quite a while there. There is much more to see and experience in Idahonia, including sky platforms, the commons building, interesting structures in the Virtual Technology and Design area, and fistulated cows grazing in a field. Although I expect to visit Idahonia again, if for no other reason than to see how the virtual diabetes center is coming along (a new island in development funded with a grant from the National Institutes of Health), I’m now ready to move on. 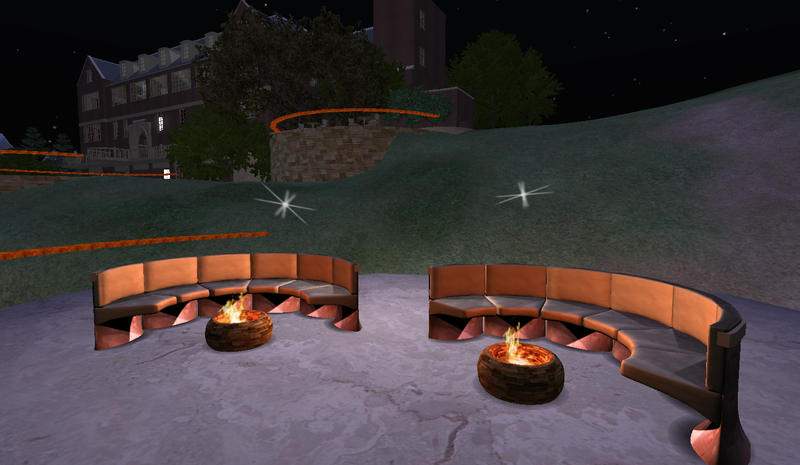 This entry was posted in Universities and tagged Idahonia, Second Life, universities in Second Life, University of Idaho. Bookmark the permalink. Hey, Lotus, great stuff. Wanted to let you know your blog is up for Blog-o’-the-month for December at ISTE Island’s Blog-o’-the-Month. You can see more at http://scottsecondlife.blogspot.com/2011/11/novembers-blog-o-month-is-virtual-and.html and good luck! I ran into this page accidentally, surprisingly, this is a amazing website. The blog owner has carried out a superb job of putting it together, the info here is really insightful. Now I am going to bookmark this internet blog so that I can revisit in the future.